The Gateway Arch in St. Louis, MO is a monument to the westward expansion of the United States. At 630 feet, it’s the tallest memorial in the country. The Gateway Arch National Park formerly known as the Jefferson National Expansion Memorial is a monument in St. Louis in the US state of Missouri. Its current location points to the starting point of the Lewis and Clark expedition. In addition, the memorial commemorates other historic events such as the Louisiana Purchase and the subsequent colonization of the West, the first civil government west of the Mississippi and the trial Dred Scott v. Sandford. The central building of the memorial is the 630 feet high, Gateway Arch. In addition to the arch, the ensemble ‘s memorial includes the old courthouse and the Museum of Westward Expansion, which is located underground together with the visitor center. On October 22, 1946, a nationwide, exclusively US citizens, an architectural competition began with a prize of $50,000, for the design of the central part of the memorial. It involved 172 architects, including important names such as Walter Gropius, Charles Eames, Owings and Merrill, Louis I. Kahn, Eugene Mackey, Edward Stone, and Kazumi Adachi. Other participants, like the well-established Finnish-American architect Eliel Saarinen and his 38-year-old son Eero. Eero, who worked with his father on many projects, was at the beginning of his career, this time he submitted a project in collaboration with landscape architect Dan Kiley and was rewarded the project. On February 11, 1961, took place the groundbreaking ceremony for the Gateway Arch. The first stainless steel triangle was laid on 12 February 1963 at the southern foot. Saarinen did not see the completion of the building, because he died on 1 September 1961 due to a brain tumor. The two “feet” of the bow were pulled up parallel to each other. When the two arched reached a height of 528 feet, they had to be fixed by an additional support frame of up to 250 feet in length. This scaffolding was shortened with increasing height until the two arch parts connected by the capstone could carry themselves. On October 28, 1965, the day of its final completion, the arched sections had expanded due to intense heat, the St. Louis Fire Department had to water the southern foot to insert the final element. The construction costs amounted to about 13 million dollars. 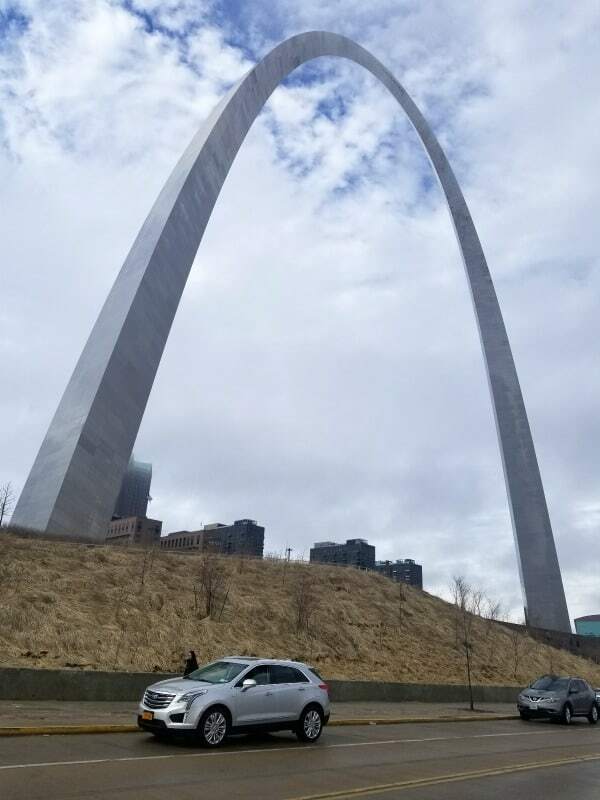 Around 11 million dollars was the cost of the arch itself, which was financed 75% from federal funds and 25% from other funds. The Visitor Center opened on June 10, 1967, for the public and since July 24, you could reach the top of the arch by elevator. In the first year, 619,763 people visited the arch. On July 4, 1976, the 200th-anniversary celebrations of the United States Declaration of Independence took place at the Memorial. Over 800,000 people were there! In the late 1960s, the 1970s and 1980s, the Gateway Arch was repeatedly the scene of spectacular aviation flights. A total of eleven light aircraft performed this type of show for the first time on June 22, 1966. On August 21, 1980, the amateur skydiver Kenneth Swyers accidentally crashed while attempting to parachute from the Gateway Arch. He slipped and slid down the arch to the ground. In 1984, David Adcock tried to climb the arch with suction cups. After he had climbed about six feet, he was brought back down by security forces. In 1987, the Gateway Arch was declared a National Historic Landmark. On 4 August 2003 became a part of the commemorative series, State Quarters, a 25-cent coin with a circulation of 453.2 million pieces as a representative of the state of Missouri. On July 21, 2007, about 200 visitors were stuck in the elevators due to an electrical problem. The next day there was another failure. More than 6000 tourists can go to the observation chamber in a single day, while thousands of others will go no higher than the underground museum between the two legs. Regardless of one’s vantage point, the Gateway Arch is a sight to behold and a fitting tribute to all those who would follow the setting sun. Nowadays, the park has a high importance among preservationists and landscape architects and is considered a valuable historical landscape. Gateway Arch National Park is the 60th US National Park!